We saw that first expansion with the Legendary: Encounters games for Aliens and Predator. And then we got the unusual deviation with Big Trouble in Little China. But I think things really took a turn once we got Legendary Encounters: Firefly as this was Whedon territory and one of the most beloved franchises he's created. And so I guess we shouldn't have been too surprised that Legendary: Buffy The Vampire Slayer was just around the corner. 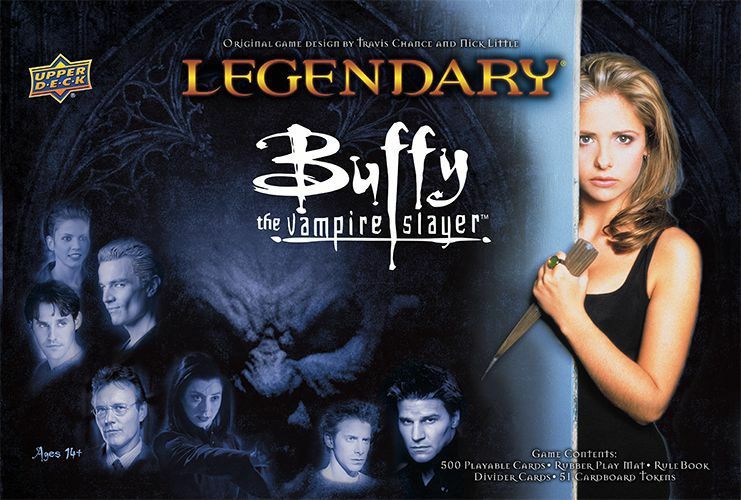 Overview: Legendary: Buffy The Vampire Slayer is a semi-cooperative deck building game designed by Travis R. Chance and Nick Little. The game supports 1-5 players and is fully playable with other Legendary games should you so desire. In the game players get to control characters like Buffy, Angel and Willow in order to put a stop to the Big Bad and their Schemes. Like in other Legendary games you need to defeat the Big Bad four times before you and your fellow heroes win. But of course the Big Bad isn't alone and you'll need to defeat the villains and henchmen. All of that generally sounds the same as the other Legendary games except for one catch - the battle between the Light and the Dark. And this is represented by a meter on the right side of the playmat with 4 levels of Light and 4 levels of Dark to manage. Thing things get too dark bad things happen. If you keep things high enough in the Light you'll get Courage Tokens that can help you recruit more cards or better attack enemies. The game will constantly go back and forth between the Light and the Dark and this prevailing state will also change what powers become available to your heroes or may give more advantages to enemies. What I Liked: For fans of the show, this game is a must-have as it truly celebrates everything about it. And they opted to use photo stills from the series instead of art, which helps us avoid the mixed bag that was Firefly's art. So we get a lot of the familiar faces not just among the heroes but also in the Bystander deck, which makes for a great mix. Then there's the whole Light and Dark balance element, which is a crazy element added to the game. Despite years of playing games in this franchise, this one still surprised us and managed to prove itself to be quite challenging. But that make sense given our little town of Sunnydale is also next to the Hellmouth, the source of so many evil things. And this is what really sets this game apart. What Could Have Been Better: What the Light gives, the Dark takes away. At times that challenge level gets crazy difficult and it's hard to find the right balance of heroes to defeat the Big Bad. And bad things will keep on happening as you stay in the Dark. Not even the starting set of heroes recommended for beginners helped things along and it took us several games before we got even close to winning. That said, the limited number of heroes do not easily make for good synergies. The Scooby Gang works decently but lack the sheer firepower that a slayer like Buffy can bring to the table. But Buffy doesn't balance out well with Angel and may actually work better with Spike? Mixing and matching isn't easy and it can get a little frustrating at times. TL;DR: Legendary: Buffy The Vampire Slayer is a clever take on franchise through the Legendary game system. It's a trickier game to master but it's quite fulfilling and a lot of Whedon fun. Thus the game gets a great 5 Potential Slayers pushing the Light up out of a possible 5.